Kate thought life would get easier now that she has faced her trials and won her immortality, but that couldn't be further from the truth. As she returns from her six month hiatus from the underworld she expects Henry to be as excited to see her as she is him, but he is cold and distant. Even so, she decides to continue on with the ceremony to make her queen, but Henry is abducted by the king of the Titans, Chronus, before they have a chance to finish. 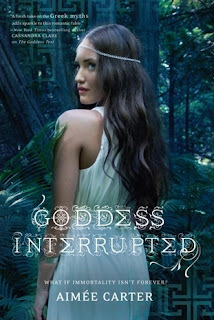 While the other gods are focused on finding a way to stop Chronus in his tracks, Kate knows she is Henry's only chance. She won't give up on him even if it means seeking out her biggest rival, the woman Henry still loves, Persephone. It never ceases to amaze me just how amazing Kate is. Her integrity is nothing short of admirable as she never once gives up even when it seems like all hope is lost. At the drop of a hat she was willing to sacrifice herself for the people she cares the most about. I honestly do not think she possibly could have been more selfless. The only thing she ever seemed to want for herself was Henry's love, but who could blame her for that? With everything and everyone coming at her from all sides, she never once falters and manages to keep her head held high, no matter how painful it may be. Its a shame the rest of the gods couldn't come close to her level of integrity and selflessness. Perhaps they wouldn't have been in the nasty situation with Chronus if they had. I was an emotional wreck the entire time while reading Goddess Interrupted, mostly passing between extreme anger, and sadness. Nothing affects me more than heartache. Even a hint of a potential emotional turmoil in the love department will cause me to tear up. I was more than a little frustrated with Kate and Henry's relationship or rather the lack there of. In the first book I had a hard time getting attached to the two of them as a couple, but I had the opposite problem while reading Goddess Interrupted. I felt so invested and emotionally attached to all of it, that everything cut me to the quick. I was so blind with anger towards Henry for his behavior and more than a little confused at Kate's determination to hold onto the relationship despite her extreme insecurities. However, I think a lot of that frustration stemmed from the fact that I knew most of their problems were due to a lack of communication, yet neither one could seem to see that. Then you add in the mess with Persephone (Who I have very mixed feelings about.) and everything just spelled disaster which left me feeling devastated more often than not. I don't want to spoil anything, but I do want to put a word of warning out, as Goddess Interrupted has a cliffhanger ending that literally made me sick to my stomach. In all of the books I have read, and trust me, that number is quite hefty, I can only think of one other cliffhanger that killed me as much. Do I regret reading Goddess Interrupted? No. However, the wait for the final installment will be nothing short of agonizing. I both loathe and praise Aimee Carter for having the chutzpah to leave things hanging like this. Then again, my devastation shows just how attached I have become to the characters, so I will keep my grumbling to a minimum. All in all my socks were blown off by the depth of raw emotion Goddess Interrupted elicited, earning it a definite two thumbs up.